The weather has been super strange this year. It is late March so the rain should be over and the temperature should be in the high 60s or low 70s. So far there have been more rainy days since the first of the year, in all recorded history for my town. It is also the coldest spring on record since 1885! At least there have been 2 days this year where the temperature actually reached 72 degrees. Global Warming is REAL and the resulting climatic changes are also REAL. This message is for the governmental agencies that do not believe. Maybe I should have said "gover-non-mental". Even Elmo knows that and he is by color a republican! I never liked that Elmo. He is just way too chirpy. Now, Oscar the Grouch is a muppet I can relate to, being a grouch myself. Plus, we know that he cares about the environment, as he is very green. Very green indeed. 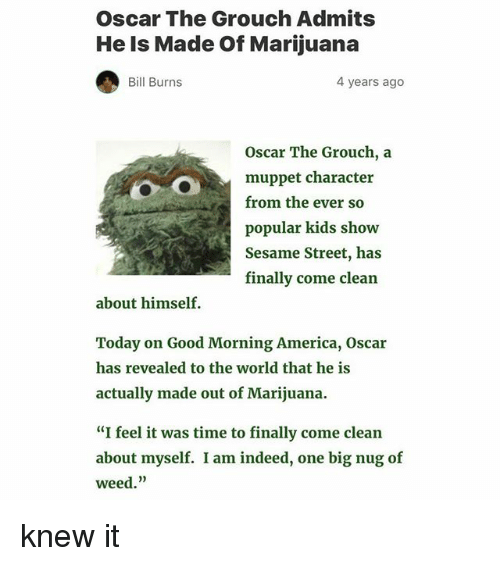 I also like Oscar because he is green and a grouch, with a hidden nice helpful side. I used Elmo because of his red color and the fact that he is chirpy. He just looks republican, and he has chirped about climate change and that we need to stop doing things to make it worse. So I was thinking he might be a sane republican. I do not care what Oscar in made of, I will not smoke him!